The dash of the bus was a dusty, mission brown mess. Cracks were starting to appear and it kinda smelt funny after years in the sun. Left hand side has some screw knobs and a board covering the washer fluid. The cassette and radio does not work so it is to be replaced. The dash on the driver's side is a challenge. Lots of knobs, bumps and holes. Someone at Nissan decided it would be a good idea to install a dash which comes off in twelve pieces! What a jigsaw. Luckily we took lots of pictures of the process. Next up is respraying the wheel with plastic spray. In some places it is rubbed so shiny, the paint won't hold but that will be covered with a cover later. Knobs and ashtray (now 'spare change keeper') gets a freshen up too. I thought these flat panels would be easiest to start with. This is felty/carpety stuff which has a line through it. Quite difficult to get straight and running all the same way. Pegs hold the edges while the glue dries. 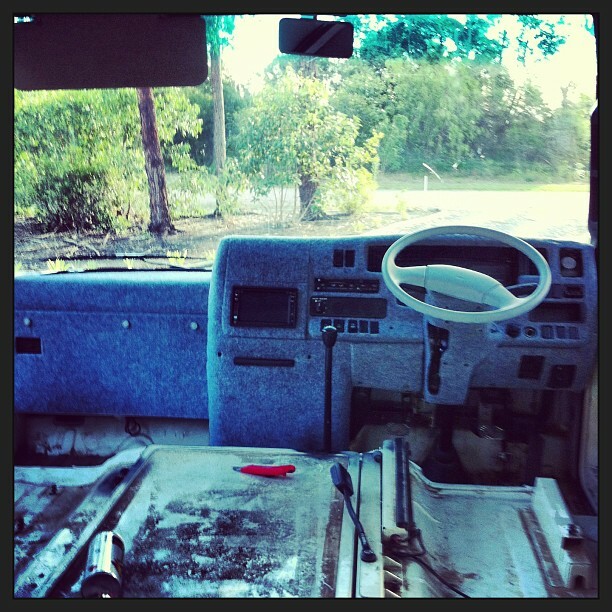 The 'inside the bus' part. With vents re-attached. I AM rather proud of that seam too! The tricky part. It took me a while to figure out the best way to do this part. All done! The new GPS/multimedia/reversing camera unit fits perfectly in the hole which once housed a cassette AND radio. You can see that we have started sticking some heat proof mat down on the floor (the engine is housed beneath it) and we will carpet tomorrow. We also bought new seats because the others were falling apart and revealing the sharp steel frame. No chance of re-covering. We purchased two new SAAS seats from Supercheap Auto which are ADR approved. We will have to get them signed off by an engineer as they are replacements but the rest of the bus needs signing off anyway, so luckily that isn't a problem or extra cost. I'll be sure to take photographs of the carpeting process too! Your dashboard looks terrific... like a professional job. I hope we can do as good a job on ours! I'm sure your dash will look fabulous like the rest of your bus! It wasn't really 'felt' in the true sense of the word... more like a ribbed, felty kind of carpety fabric. Very difficult to explain. You might have seen it on corporate pinboards. I'm not sure how it will hold up to the UV over time but it is doing well so far.